Boil: Bring a large pot of water to a boil and add the potatoes. Boil for 10 minutes or until potatoes are fork-tender. Smash: Preheat oven to 450 degrees F (232 C). Strain potatoes then set on a large parchment paper-lined baking sheet. Use a spatula or the bottom of a glass to firmly smash each potato so it is flattened (it's okay if this is messy!). If your potatoes fall apart when you smash them, try smashing faster and with more force, using the bottom of a glass (or boil for a few minutes longer if too firm still). 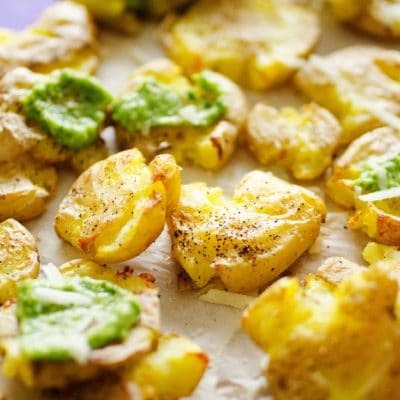 Bake: Drizzle potatoes with olive oil, brushing it in so that each potato is evenly covered. Sprinkle with salt and pepper then bake for 20 minutes, or until outsides are golden brown and crispy. Blend: While potatoes bake, make the Avocado Pesto. To a blender or food processor add avocado, basil, parmesan, garlic, and lemon juice. Blitz until smooth, then with the blender/processor running, pour in the olive oil. Add a touch of water if needed to reach a thick pourable sauce consistency, then season with salt and pepper to suit your taste. Serve over warm smashed potatoes. Recipe from Live Eat Learn at https://www.liveeatlearn.com/smashed-potatoes-avocado-pesto/.